The website is fantastic for finding any recipe you could possibly want. I’ve got so many cook books, but to be honest they rarely get used – which is a shame. I want a recipe, I simply google it and pick the one with either a good picture, or good reveiws. Even so, recently, I haven’t been so lucky with my internet searching for a particular recipe – or cook book searching. There is a bakery in Christchurch which is one of my mum and mine’s humble favourites. It’s a ‘european’ bakery, and the food is always good – as in, really good. It’s not overly high class, yet it’s a far cry from your typical corner bakery. My personal favourite is either mud cake, carrot cake, cheesecake (yes, I like cake) or gingerbread men. My mum, on the other hand, prefers the almond rondo’s, apple pies and a particular flan called baked cherry streusel. This is where it gets complicated in my recipe searching. A ‘streusel’, to my knowledge, is like a crumble, therefore you may think a cherry streusel would be like apple crumble, but it’s not. Baked cherry streusel, is a long skinny flan, with a delicious butter crust, filled, with baked cheesecake and topped with big plump cherry’s. Sounds simple enough, but according to the web, and all my cookbooks, this tasty desert simple does not exist. Although it’s not one of my personal favourites, I’m always up for a challenge, and to please others – so I decided to see if I could do a better job of it. I searched for hours (literally). 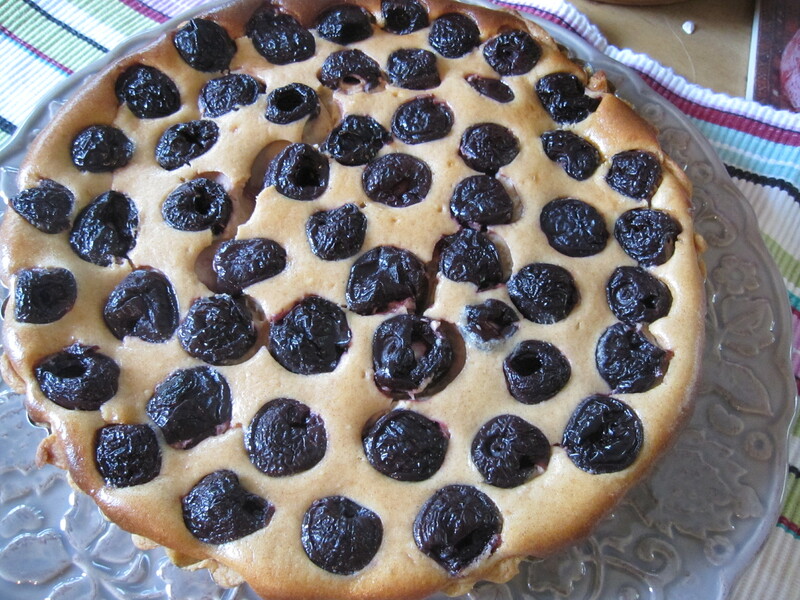 I couldnt find anything that even came close to recreating the ‘cherry streusel’ – untill I resorted to simple making up my own recipe of butter crust, baked cheesecake and cherry’s – which was when I found this post http://www.cookitsimply.com/recipe-0010-014q800.html . Not exactly cherry streusel, but it sounded just about right. After making it, and some sampling, mum decided it was pretty close, I had the idea – although I was bitterly dissapointed I added the cinnamon, the original ‘cherry streusel’ deffinatly does not have cinnamon. I thought it was rather nice, but it simply wasn’t the same as the original due to the cinnamon – it’s sitting in the freezer at the moment, waiting for another morning tea. So, if anyone reading this has heard of anything similar – let me know! There must be another name for it – and I’m pretty keen to try and make another one. If not – thanks for reading, and have a great weekend 🙂 ! 1. Line a shallow 23 cm (9 in) tart tin with the pastry and pre-bake or bake blind.2. Pre-heat the oven to 190°C (375°F) Gas 5. 3. If using fresh cherries, remove the stones and stalks from three-quarters of the cherries. This requires patience but is very rewarding if undertaken sitting at a table with a good friend-and sipping something reviving. If using bottled or canned cherries, drain them thoroughly and soak up any excess liquid on kitchen paper. 4. Place the sour cream, cream cheese, cinnamon, lemon zest, eggs and soft brown sugar in a bowl and mix well to remove all the lumps of cheese. This will produce a thickish liquid mess. 5. 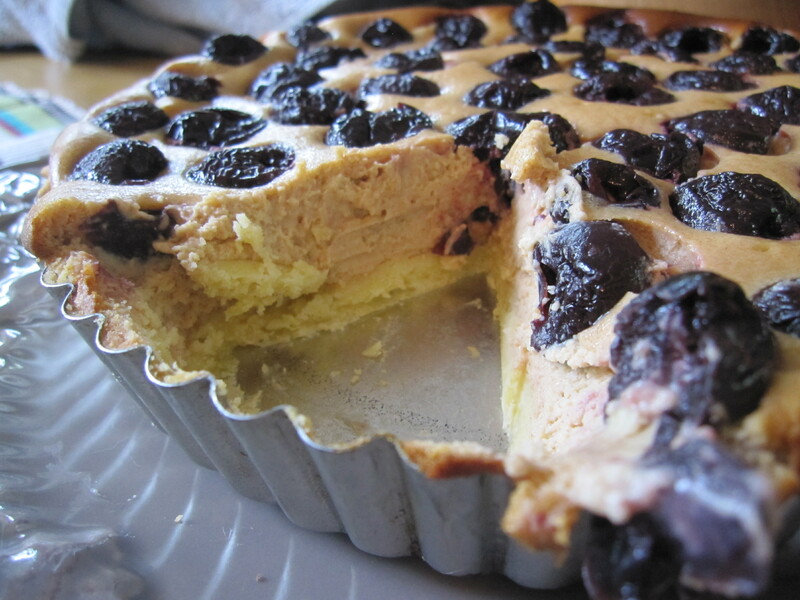 Assemble the tart by spreading a thin layer of cherry jam on the pastry base, spoon the cheese mixture over the top, then drop the prepared fresh cherries or three-quarters of the bottled or canned cherries into the liquid. They will all but disappear with just a bit of some tops showing. 6. Sprinkle the top with the demerara sugar mixed with the cinnamon. Bake in the oven for about 35 – 40 minutes or until the filling has firmed up (the top of the cherries may look a little wizened, but a good dusting of icing sugar when cool will hide the wrinkles, if they worry you).